Contemporary music taking place in unconventional places and spaces has to a large extent become the new normal, as has the concomitant tendency for composers to mould their creativity into site-specific works. 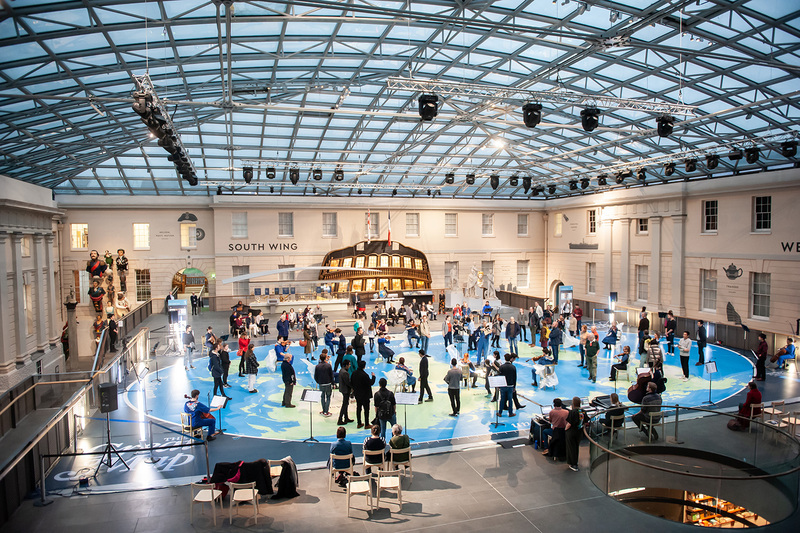 A striking example of this took place last Saturday at the National Maritime Museum in London, for the first performances of Hollie Harding‘s Melting, Shifting, Liquid World. Harding is currently a PhD student at Trinity Laban Conservatoire – just a hop and a skip up the road from the museum – and her research is concerned with, among other things, “investigating space and action – movement – as elements of composition”. For Melting, Shifting, Liquid World this basic premise has been shaped by concerns about climate change and ocean pollution. The piece is made up of three distinct elements. 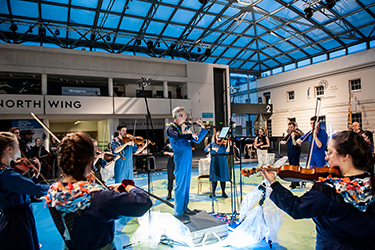 The first consists of a string orchestra, the members of which are dispersed throughout the performance space and who at certain points move around it. A solo electric viola is the second element, positioned at the centre of the space and acting to coordinate and cue the string players during the piece. On this occasion those parts were played by soloist Nic Pendlebury and the Trinity Laban String Ensemble. 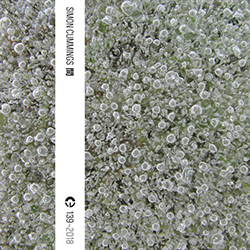 The work is completed by an electronic part heard by the audience through bone-conducting headphones, enabling one to to experience all three elements simultaneously. Use of this type of headphones wasn’t just a clever solution to the question of how to place the audience within three discrete layers of sound and perceive them all clearly and distinctly: spacial and directional sense is lost when sound is conducted in this way, resulting in a peculiarly intimate form of listening in which the sound appears to be materialising inside one’s head as if from nowhere. So the result was an entirely different, much more expansive sense of immersion than one usually experiences. The work’s title could hardly have been more directly relevant to what the music was doing. It was easy to hear its slow changing and evolving forms as processes of shift and melt, and the fluidity of Harding’s material – no solid sonic objects here – combined with the way we could move anywhere at any point to create a world that felt decidedly liquid. 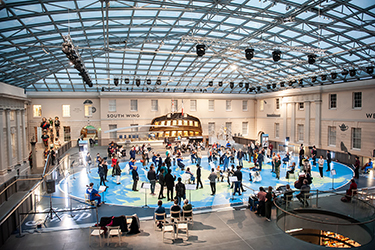 This was aided by the performance taking place on the Maritime Museum’s Great Map, a large atlas of the world laid out across the floor. In a way that one could easily think of as tectonic, the piece exhibited interesting tensions. There was an abiding sense of indeterminacy, of music emerging spontaneously from guidelines and options rather than black-and-white, preordained certainty, yet this acted in conjunction with a clear sense of, if not necessarily direction, then certainly organisation. Further tensions emerged between tendencies toward dronal stasis and large dissonant agglomerations, the flat map beneath our feet seemingly being extended upward into something three-dimensional through the pronounced shifts in musical contour. This tension, in particular, was at times highly dramatic: much of Harding’s music was warm and attractive, not far removed from a post-ambient aesthetic, so the occasions when its clarity and stability became challenged – pitches tremulously beating and shimmering against each other, growing into more abrasive swells – was disconcerting, all the more so as we were literally situated in the very midst of it. Apropos: moving around the space during its 32-minute duration was no optional extra but an essential way to engage properly in the layers of perspective Harding had embedded in the work. During various textural sequences made up of small, individual gestures, even relatively minor changes in one’s position resulted in a radically-altered perception of what was happening, emphasising the music’s broad sense of scale. 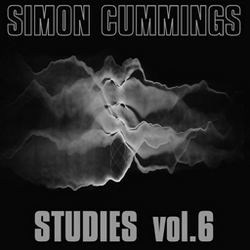 This was expanded inwardly through the headphones, in which field recordings of sea ice from the Arctic (sourced from none other than Chris Watson) provided a more abstract counterpart to the live string sounds. The combined effect, to co-opt one of Harding’s main metaphors for a moment, wasn’t unlike walking around a huge ice sheet, hearing its network of tiny cracks and minuscule fractures that together conveyed a generalised impression of large-scale immensity seriously undermined by small-scale fragility. As such, while most members of the audience did indeed move around the space, it was baffling why so many of them kept fixing their gaze inward towards the centre; fair enough when Pendlebury was performing, but for the majority of the piece this was music with absolutely no central point, and often little sense of where the live instruments ended and the headphones began, its different elements echoing, imitating and overlapping each other, together forming something that seemed to extend in all directions towards infinity. Pendlebury’s amplified solo episodes introduced not just lyricism but melancholy, especially at the work’s end which was hard not to hear as a heavy, full-blooded lament. This was perhaps the most telling tension running through Melting, Shifting, Liquid World, the way Harding kept tilting the music between beauty and pain, comfort and uncertainty. It could simply be read as a fascinating study in musical ebb and flow, pressure and release, but beneath that fast-melting surface it was impossible not to reflect on the poignancy and urgency at the work’s heart.